Senior Lance Jones calls a play at the State championship. With under 20 seconds to go in the 4A State championship game down 12 points, coach Mike Ellis subbed Ryan Bost, Jaheim Holden and Lance Jones out of the contest. With their exit went the most successful three years of basketball in recent ETHS history. 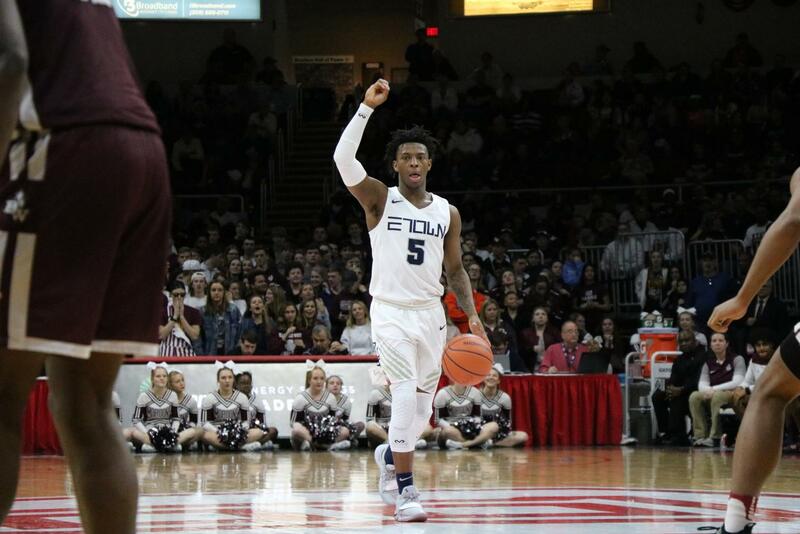 “[Bost, Holden and Jones] have given so much to the culture and tone of our program, there’s nothing I can say to show them how thankful I am,” Ellis said, following the championship game on Saturday. 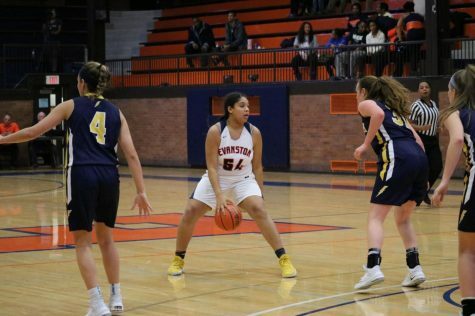 The three star guards, who had played together since third grade, filled vital roles for the Kits since their sophomore season when Evanston reached their first of three consecutive Super Sectional games, losing a tight game to eventual State champion Whitney Young. 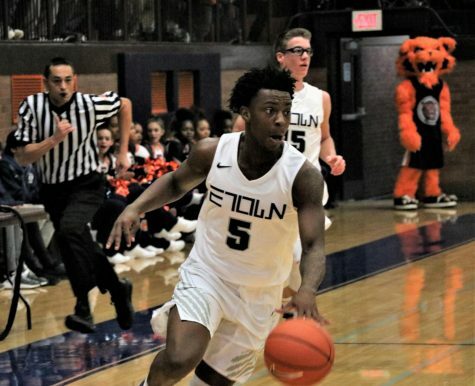 Last season, with the departure of star seniors Nojel Eastern, Chris Hamil and Elyjah Williams, many in the Chicagoland area anticipated a rebuilding year for ETHS. However, with leadership from the junior backcourt trio, the Kits shattered expectations, reaching the same stage from the year before — only this time getting over the hump with a dominant victory over Lake Zurich to reach Peoria for the first time in a decade. The team went 1-1 in their two games in Peoria and took home a third place title. After the junior season success, finishing third sparked a theme of unfinished business for the trio’s final year. However, they still had their fair share of doubters. With the departure of the team’s only true big man, 6’8” center Matt Hall, to Ohio Dominican University, Ellis started a five-guard lineup, with no player taller than 6’3”, which came with its fair share of critics. Nevertheless, Bost, Holden and Jones led the Kits to another Peoria appearance, placing second behind the Belleville West Maroons. The loss was devastating for Evanston, especially after leading by 10 in the first quarter and by six at halftime. Belleville’s lengthy lineup eventually wore Evanston down in the post, as their presence drew double teams which opened up lanes for Maroon players to cut into. 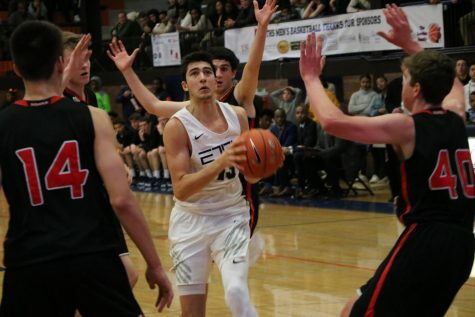 The Kits, usually stellar from three-point line, shooting 12-19 from behind the arc in their semifinal victory over Rockford East, only converted on four of their 24 attempts. 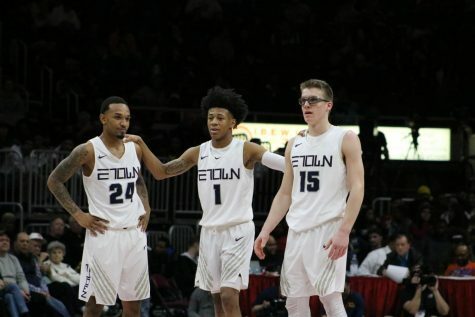 While the game didn’t go Evanston’s way, the success of the trio in their Evanston basketball career is evident. 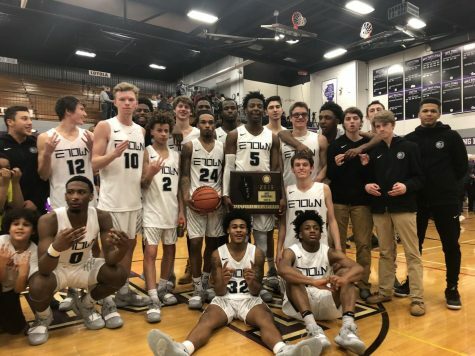 In the three seasons in which Bost, Holden and Jones were varsity mainstays, Evanston went a combined 108-15 and racked up 16 playoff wins. “We want to leave a legacy of brotherhood, leadership and togetherness,” Holden said. The themes of brotherhood and togetherness were evident this season when sophomore Louis Lesmond moved to Evanston from France. Lesmond had the difficult task of coming into a completely new culture and country but the senior guards welcomed him to the team with ease. Even though the guard trio of Bost, Holden and Jones will all be in different uniforms next season, skilled underclassmen including sophomores Jaylin Gibson, Isaiah Holden, Louis Lesmond and Blake Peters are more than ready to step into leadership roles. “Especially with Jaheim, I’ve never seen a person with better leadership skills, with the way he was able to bring us all together, and without his influence we definitely would not have made it to the State championship game,” Peters said. As Bost, Holden and Jones end their careers in orange and blue, they also end an era easily considered as some of the most successful basketball played in Beardsley Gym.